Slowly, but steadily, Three Fields Entertainment is getting closer to that full-fat Burnout experience. The original Danger Zone was an enjoyable if finite, crash simulator with an absorbing high score chase. It was missing the open road though, so with Danger Zone 2, Three Fields takes that step closer with a larger scale and scope for the crashtastic action, but will technical hitches marr the improvements made? For Danger Zone 2, Three Fields has taken the action out of the virtual crash test facility and thrust it back out on the highways and motorways of the US, UK and beyond. The end game is still about creating as much vehicular carnage as possible, and there’s definitely a lot more of it this time around. Now, however, there are objectives to hit and obstacles to overcome before you even get to the sweet spot. 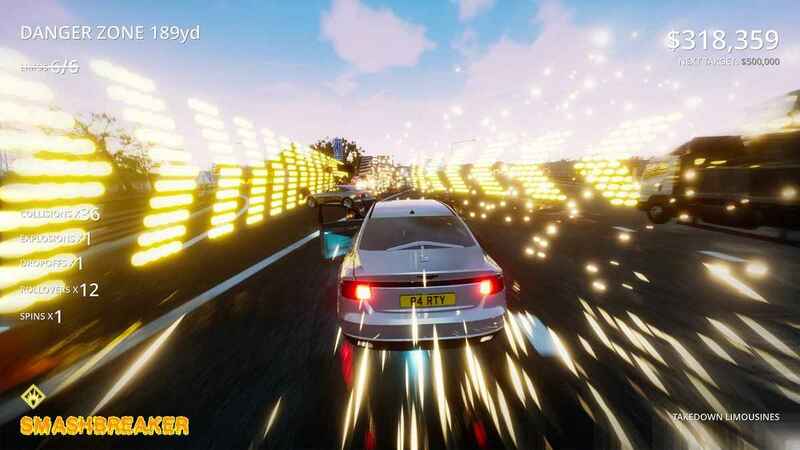 More than ever, this is a modern replication of Burnout’s famous Crash Mode, and for the most part, it still inspires huge grins and repeated plays as you create utter carnage while striving to beat your top score. It’s an evergreen system that remains pleasing to partake in to this day. The ‘one more go’ factor that was once so essential to this mode is present, even if your patience does occasionally strained and stretched by some of the game’s technical quibbles. As ever, you get to the end of your run, cause a certain amount of crashes, and unleash your smashbreaker to fling the crumpled carcass of your own vehicle about a bit longer, attempting to hit bonus tokens to ramp up up the damage meter (basically, the cost of the damage you’ve caused in dollar form) and climb that leaderboard. The variety is upped in terms of vehicles, with regular cars backed up by trucks, sports cars, and F1-style twitchy speed demons, each bringing its own set of challenges and problems. Take the F1 car. Its handling harks back to the golden age of Burnout with its fast-paced twitchiness, but it doesn’t feel finely-tuned enough to really nail that balance of speed and responsiveness. The result is some of Danger Zone 2’s most thrilling, yet aggravating moments, as you scrape past lurching lorries or see yourself utterly demolished by one. The sweet spot is hard to decipher though, and frustration grows as you get obilerated by a mere scrape one moment and safely smash against a barrier sideways relatively unscathed the next. The F1 car is the worst offender though, with the other vehicles proving to be a bit more even-handed. The other gripe is the presentation. While satisfying in its collisions, Danger Zone 2 lacks a bit of pizzazz. The stylish blur of sparks and nitrous synonymous with Three Fields’ previous history is somewhat absent. As is a memorable, pulsating soundtrack and a level of detail when it comes to crashes. Danger Zone 2 is certainly working on a tight budget, so it is at least understandable. One of the better additions to Danger Zone 2 is the side objectives, such as smashing up a bunch of limosuines! Onrush recently hid its shortcomings quite well by relying heavily on the style to beef it up, and it worked superbly. While there’s less expectation and scope for Danger Zone 2, meaning it isn’t quite as critical an issue as it could be, there is no denying how much of an impact a bit more flourish could have had to the game. Hopefully, Dangerous Driving is better served in this department. It’s also rather unfortunate that Danger Zone has some framerate trouble, with the high-speed action taking a stuttering step now and again. Thankfully it has yet to cause any issues in gameplay terms, but with the aforementioned lack of pizzazz, it’s another blot on Danger Zone 2’s copybook. Still, these are fixable problems, and Three Fields has done pretty well at tweaking its game’s quibbles so far. What matters is that core loop, and despite the odd hitch, it really is key to Danger Zone 2’s quality. 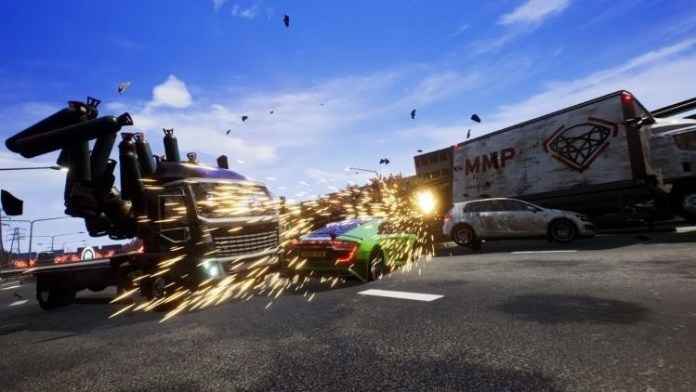 It rips out one of Burnout’s greatest achievements and builds a whole game around it in a far more coherent manner than the original Danger Zone managed. This is easily a superior beast to its predecessor, but perhaps not quite to the level it could have been. 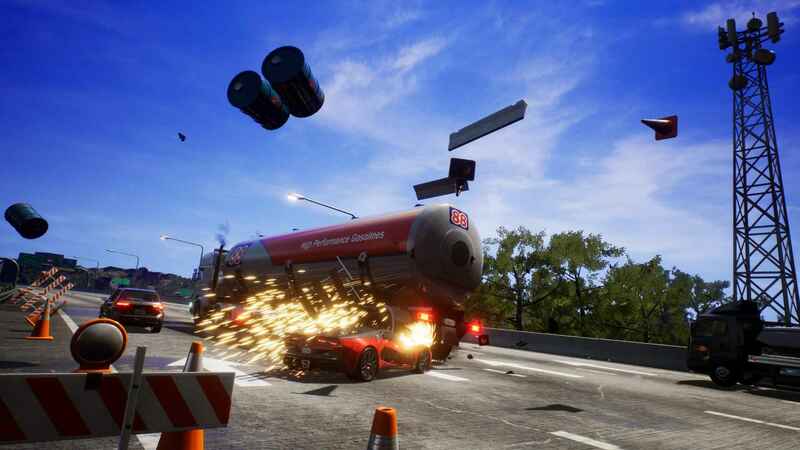 In the world of Danger Zone 2, a sports car is encouraged to fight petrol tankers. As a taster for what is to come with Dangerous Driving, Danger Zone 2 feeds the need for speed (and crashing). So at the very least, it does the job it set out to do. 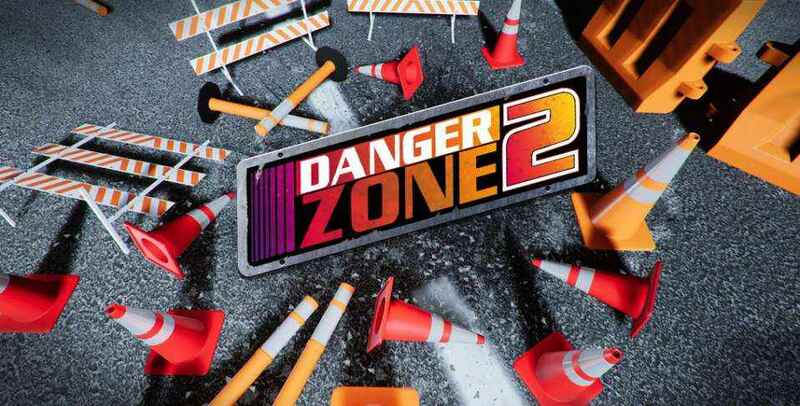 Danger Zone 2 review code provided by Three Fields Entertainment. It may be a bit rough around the edges, but Danger Zone 2 usurps its predecessor with a smash 'em up high score chaser that captures the joy of Burnout's Crash mode.